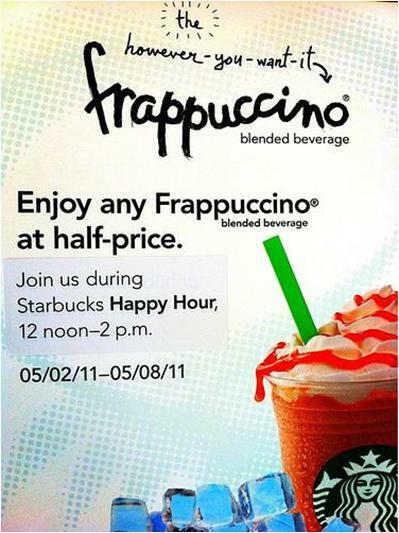 Starbucks Philippines is offering all coffee fanatics a half-price of any Frappuccino drink. This is Frappuccino® Happy Hour's 50% off on any Personalized Frappuccino® blended beverages, applicable only from May 2-8, 2011 from 12nn-2pm. This promotion is valid only in all Starbucks Philippines stores. This offer cannot be combined with other offers or promos.